Today, Google is rolling out its update to Google Reader which features the promised user interface overhaul, and, more importantly, the new Google+ integration. 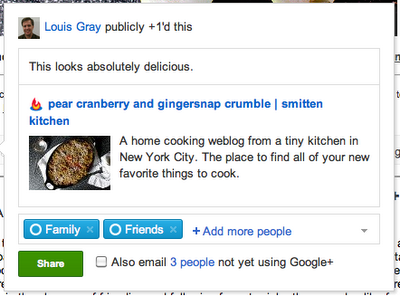 Now, Google Reader users can “+1” items directly from Google Reader to share it with their friends on Google+. This feature now replaces the “Share” and “Share with Note” options previously present. As expected, Google has ignored the cries of the niche community of Google Reader sharing enthusiasts (as well as what seems to be the entire online population of Iran), and has pushed forward in its plans to remove Google Reader’s native sharing features to promote deeper integration with Google+. While the ability to share with Google+ is an obvious important step forward for Google’s social agenda, it will be disappointing change for at least some of the Google Reader community – a community that even went so far as to create a petition to save the old features. The petition is now pushing 10,000 responses. It didn’t have to be this way. Kevin Fox, who helped design Google Reader back in the day, suggested that Google rebuild Reader’s social sharing feature using the Google Plus API as a foundation. That would have kept existing users happy while also allowing others to broaden their reach through social sharing to Google+. 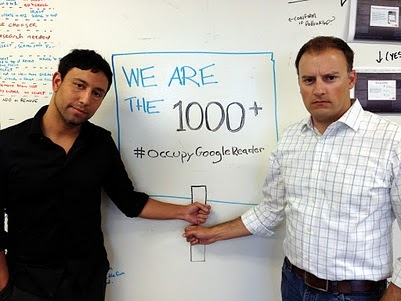 Even the “we are the (1000+)” #occupyGoogleReader meme (from Google Reader’s creators, no less!) didn’t seem to help. We hope you’ll like the new Reader (and Google+) as much as we do, but we understand that some of you may not. Retiring Reader’s sharing features wasn’t a decision that we made lightly, but in the end, it helps us focus on fewer areas, and build an even better experience across all of Google. And if you don’t like it? Well, too bad – this is the future of Google Reader. For those not happy, there’s the door. #DoNoEvil? “If you do decide to stay,” writes Alan Green on the official Google Reader blog, Google wants to hear your feedback. An Android app update will follow, says Google.